Hear Ye! Hear Ye! A Madison, Alabama family is working together to provide “Fun to Read Books with Royally Good Morals” for Princes and Princesses throughout the land! These Royal Books are making their way around the world. Some of the books have already reached out to at least 23 states across the country including California, Colorado, New York, Indiana, Pennsylvania and Hawaii! Some have even made their way to Scotland, Ireland, Germany, Fiji and Australia! What makes these books so special? It could be that this all started out as a “Mama” writing for her sick child. It could also be because that same child, Ashlyn McCauley Dozier, now 8 years old, became the Illustrator and children can really relate to her drawings. Another possible reason is that each book comically teaches a lesson that most of us have had to learn and/or teach in a hard way. But more than likely the reason they are so successful is that they are the result of a family working together on a worthwhile project. Kim writes the stories; oldest daughter Ashlyn McCauley draws the pictures; husband Mike, gets it all ready for the printer and youngest daughter Makenna Joy (age 3) is the comic relief! Three of the books in the Royal Series have been released thus far. The first Book, “The Forgetful Princess” was released May 1, 2003 and Kim personally sold 500 copies in just 20 days. The book is a story about a little Princess who forgets to behave as a Princess should. Her behavior, or rather the lack thereof, lands her in the Dungeon! A change of heart sets her free. The second Book, “The Ear-less Kingdom” was released October 1, 2003 and nearly 1,000 copies have been sold as of now. The book is a story about a Princess who talks soooooo much; she talks everyone’s ears off! She learns a lesson, which rescues the Ear-less Kingdom. Orders for the third Book, “Where’s Dwight Dragon” were pouring in from as far away as Connecticut before the book was even released this past September! Already a family favorite, it is a story that will help you get each day started on “Dwight” foot. Throughout her visits to read at many schools during the past year, Kim began noticing that children and adults were mesmerized by her dramatic reading style. Many of them had never heard how a story could be brought “to life.” Kim asked Jeffrey Hensley of Madison to help her make Read-Along CDs in the hopes of preserving this dying art form. The positive response from young and old readers/listeners has been tremendous! In the mean-time, Kim met Athens artist, Denise Etter-Collins and her husband, Charlie Collins at the 2003 Fiddler’s Convention. After seeing some of Denise’s work, Kim asked if she could make dolls to go along with the books. After several weeks of encouragement from Charlie, Denise agreed. She has done a beautiful job designing and handcrafting dolls based upon Ashlyn’s drawings in the books. On February 1, 2004, “The Forgetful Princess” Doll was released with a Second Edition of the Book and a Read-Along CD. “Ima Dragon,” the Doll for “The Ear-less Kingdom,” was released in July at Pablo’s on Market Street in Athens, the newest store to carry The Royal Series. Kim plans for Denise to make dolls for each book. Release dates for the remaining Books in The Royal Series are scheduled for every March and September until at least the year 2006. These dates allow the new books to be made available to the public at the NEACA Craft Shows in Huntsville, where you are always cordially invited to come meet author, Kim Dozier in person. Kim signs books especially for your “Prince” and/or “Princess” making them perfect gifts for any occasion! Kim is honored that she has been invited to be among the featured authors at the 2005 Alabama Reading Association Fall Conference in Huntsville and the 2006 Southeastern Regional Fall Conference in Mobile. In North Alabama, look for the Royal Series at these fine stores: Pablo’s in Athens; The Learning Tree in Decatur; The Victorian Tea Room in Muscle Shoals; Mars Hill Bookstore in Florence; Shaver’s Books in Huntsville and Young at Heart in Madison. 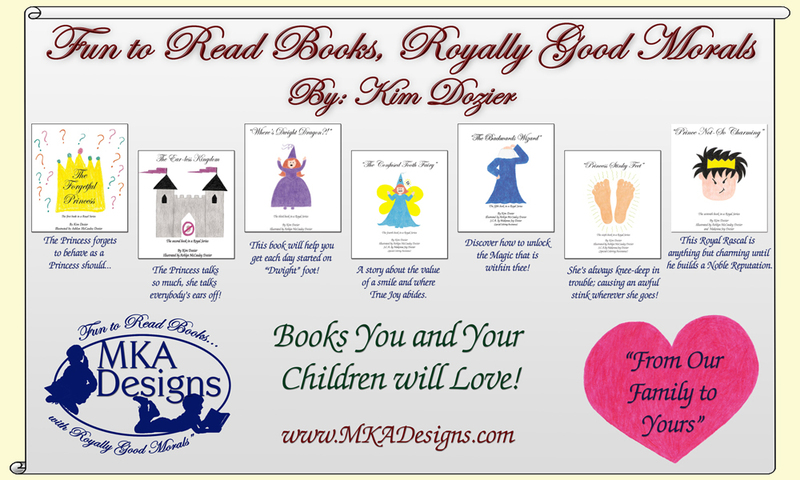 To order the books on-line; for a complete listing of stores and events; for more information or to contact Kim about a Royal Reading, visit: www.MKADesigns.com.